by Meka Taulbee via SailFit, Inc. Considering that all of us have to travel to get to the majority of regattas, I thought I would give you a list of ways to stay fit while on the go. Whether you drive or fly to regattas there are some items that you can bring that won’t take up much room. Now what do you do with this stuff or lack of stuff that you packed? 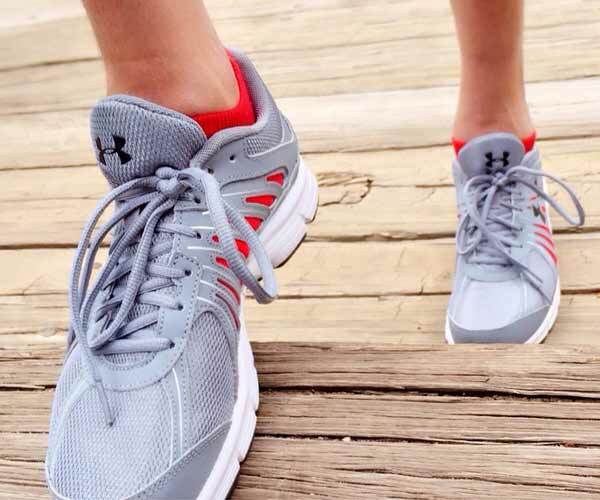 1 – Run laps around the rest stop before you take off. You can get off at an exit and run around the town you are in. 2 – Look for a gym in a near by exit. Even a YMCA or community center will have a pool, track or exercise facilities. 3 – The gallons of water can be used to work your shoulders by doing side raises, your chest by doing upright rows, your shoulders and back by doing overhead presses. You can also work your biceps by doing curls and your triceps by lowering the water from a straight arm position over your head to a 90 degree bent position behind your head. You can also use anything that has a little weight to it for these exercises. You’d be surprised what you can find when you look. 4 – Exercise Mats can be used to stretch, do crunches and pushups on. This can also be used as a pillow and to wrap your blades in to protect from damage (very good when flying). 5 – Weights and a Jump Rope are pretty self explanatory. 6 – Elastic Exercise Bands use resistance to build strength. You can perform seated and upright rows, lateral raises, leg raises, curls and a variety of presses. You can work almost every muscle group. 7 – A Medicine Ball can be used to add weight to crunches or pushups. Even just throwing and catching something with some weight to it works your muscles. 8 – Ankle and Wrist Weights are good to wear while doing any type of workout. Even though it may not be a lot of weight it adds more resistance and makes your muscles work harder than just moving your own weight. When wearing them for a while and you then take them off, you feel much lighter than you would expect. 9 – When you park somewhere try parking in the back of the parking lot. Just a little walking will get the blood moving and the metabolism working. 10 – Whenever you stop take just a minute to stretch. You muscles need to work through some range of motion. This will help you to not feel so stiff and the movement will make you feel a little less lethargic. There are weights that are made specifically for travelers. They are plastic tubes you can fill with water making it as heavy or light as you like. These activities will not make you an elite athlete, but they will keep the blood moving and your metabolism from falling asleep. Muscles have memory and once you are able to resume your normal routine they will be just as strong in no time. Remember to watch your nutrition. It is easy to snack and eat fast food and this adds up before you know it. If you are in the car you can bring a small cooler and most hotels have a small refrigerator. Try filling them with fruits and vegetables. You can easily make a great sandwich or sub for a meal and some fruit to snack on. Not to mention save a little money. Most importantly, if the water is in a gallon jug or in a plastic tube it does not count as water consumed for the day. Eight to ten glasses are what have to go in. Meka is a Holistic Health Practitioner, Holistic Nutritionist, Certified Personal Trainer, and Sports Nutrition Consultant with a specialty in Plant-Based Nutrition. She has been training Laser sailors for over 16 years.